Pedestrians involved in traffic accidents are at a substantially higher risk of severe injury and death than any driver on the scene. Car accidents involving pedestrians accounted for nearly 40 percent of traffic-related deaths in 2017, with 78 pedestrians being killed in traffic collisions in Clark County alone. This staggering number—a nearly 25 percent increase over 2016—can be attributed to several causes of pedestrian-related accidents on the part of drivers and pedestrians. While one of the causes is pedestrian error for which the pedestrian cannot recover unless a driver was more at fault than the Pedestrian, other causes include speeding, driving while intoxicated (DWI) and distracted driving, deadly forces on their own and even deadlier when combined. 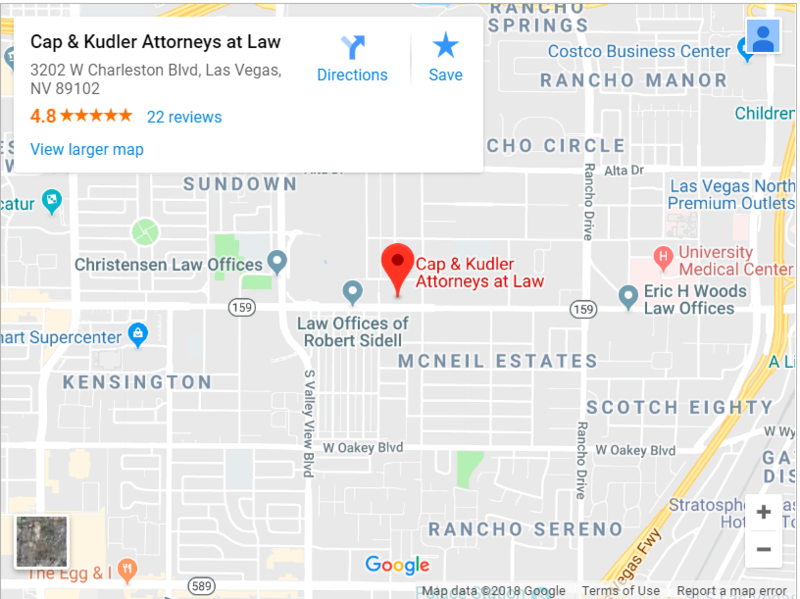 Cap & Kudler is dedicated to representing pedestrian victims across Las Vegas during both the claims and litigations process to ensure that all damages related to a car accident are recovered. Through decades of personal injury representation, we have come to realize the importance of understanding what to do when you are involved in a traffic collision—especially as a pedestrian—and how a basic knowledge of traffic safety can be the difference between life and death. In 2017, there were 78 pedestrian fatalities in traffic-related collisions in Las Vegas alone. This contributed to nearly 40 percent of the total number of traffic-related fatalities that year across Nevada, and was a 25 percent increase over the number of fatalities in 2016. Primary contributing factors to pedestrian fatalities in traffic collisions included speeding, driving while intoxicated (DWI) and distracted driving on the part of drivers, and jaywalking, distracted crossing and failure to heed traffic signals on the part of pedestrians. What is Being Done to Prevent Pedestrian Fatalities? In response to the rising number of pedestrian fatalities across Nevada—which consistently rank the highest in the nation—certain programs designed to bring the number of pedestrian fatalities to zero have been introduced in an effort to make Nevada’s roads safer for drivers and pedestrians alike. These include programs like ePEDemic, launched by the Nevada Department of Transportation, which features billboards, digital ads and radio announcements designed to raise awareness and promote attentive driving and pedestrian behaviors. NDOT also completed construction of the Boulder Highway Pedestrian Crossing in mid-2017, the first of several projects aimed at increasing pedestrian safety in several key locations in Las Vegas. This $3 million series hopes to improve existing intersections and add midblock crossings for pedestrians at eight locations that have seen unusually high levels of pedestrian fatalities in recent years. For many in Las Vegas, walking is a daily part of life. Fortunately, there are ways to remain safe while walking alongside busy streets and minimize the risk of potentially fatal injury. For example, poor property maintenance, sidewalk or parking lot defects and/or construction or other debris on walkways can cause or contribute to these accidents and should be avoided whenever possible. Be cautious when walking after school or work; dusk is when many accidents involving pedestrians occur due to the combination of decreased visibility and increased vehicle congestion. Drivers can also do their part in looking out for pedestrians who share busy intersections as they attempt to cross the road during high traffic periods. Anticipating pedestrians at specific locations—such as mid-block crossings or corners—will help to avoid having to slam the brakes or swerve out of the way to avoid hitting them. In addition, obeying traffic signals and slowing down in areas with high pedestrian presence also eliminate two of the most common causes of pedestrian fatalities in car accidents. Victims of pedestrian accidents often need medical care to make a recovery, and it is important that they have access to this care without issue as to payment for the services. These victims also have the right to seek financial compensation for lost wages and other financial issues that may have arisen from the accident. Unfortunately, many insurance carriers fail to see the severity of these types of accidents and often try to make a small offer for compensation. Many even try to blame the pedestrian for the event and will not want to cover any of the expenses associated with the accident. Because of this, it is very important to consult with a pedestrian accident attorney as soon as possible after the event. More than 70% of pedestrian accidents in the United States result in the death of the pedestrian, making this a serious concern and problem. For more information on pedestrian accidents or to discuss how you or a loved one can go about filing a claim, contact us today to schedule a free consultation.